I have no idea when exactly it happened. Somehow, our worship of God at the Table was pushed to the sidelines, and the stage (or platform) have become the central focus. Strange, for a stage, or BI-MA (the Hebrew word that describes a high place) is exactly where God forbids us to worship Him! Yes, I know, the stages at our modern congregations and churches are nothing more than equipment, designed to enable the hundreds or thousands present to better see what’s going on, but for a while now I have a deep longing to go back to the Biblical setting. The original framework of worship is based on the pattern of the Tabernacle. When God commanded Moses to erect it, He not only provided him with a list of materials, sizes and colors, but literally showed him something. “Make this tabernacle and all its furnishings exactly like the pattern I will show you” (Ex. 25:9. See also v. 40; 26:30; 27:8; Heb. 8:5; 9:11, 23-24 etc.). Later on, David set out to build a temple, much fancier and grandiose than the original format. In the Temple, everything was multiplied 10 times; in the Tabernacle – each piece is a work of genius, but very simple, all established according to a human scale. The Tabernacle is not just a historical structure, made obsolete. It is still valid today. Yeshua himself passed through a structure not created by man, and both the Book of Hebrews and Revelation include multiple mentions of some of the articles found in that heavenly Tabernacle (see Heb. 8:2). The Temple was built of Cedar trees, that were not indigenous to Israel. They had to be imported from Lebanon. The Tabernacle, on the other hand, was built of Acacia wood, found in the wilderness, right where the Israelites were at that time. Cedar wood is every carpenter’s dream material: thick, straight, large logs. Acacia trunks are every carpenter’s nightmare: twisted, crooked, thin, prickly. But that’s what they had on hand, and that is what God eventually filled with His glory. God never expects us to bring from without the materials from which we will build a tabernacle full of His glory in our hearts. To the contrary, He wants us to bring the thorns, the twists and crookedness, our brokenness. He will do the rest. It’s not a simple concept for us to digest. We prefer Cedar trees, high places, power, might. But then it is our glory that can be seen, not necessarily His. In the original Tabernacle there is a table. On it was the showbread, The bread that saw, observed, God’s faces. The priests ate it once a week, after replacing it with fresh loaves. There were also KSA-VOT on the table – a unique and archaic term, which researches are not clear as to its exact meaning. Some think these were vats or pitchers of wine. I like that. Here is the earliest ever version of the Lord’s supper. There, in the holy place, and not in sight of the whole crowd, the priest faced God and dined with Him. It could happen only after he cleansed himself with blood (Bronze Altar), washed himself with water (Laver) and examined the intentions of his heart in front of the Lampstand. Only then he was ready for a moment of deep intimacy with his Maker. Judaism has developed the beautiful tradition of the Shabbat table. On it too we find bread and wine, but here – the intimacy is more horizontal – between us and our loved ones, our family and friends. Around this table our eyes delight in the views and aesthetic colors, while our bellies are filled with delectable food. A feast for all senses. This is the time to stop the weekly race, catch up with everyone, read from the OT portion designed for the week, and even discuss its ramifications for all those seated at the table. Around the Shabbat table each one has the opportunity to express their voice, to have their views and opinions heard. Yes, someone is guiding the conversation, but he is not standing on a raised platform, requiring all eyes to be set on him alone. What a profoundly more natural way to worship God. This week we will set yet another special table, the Seder table. There too we will fill our bellies, while we remember that our forefathers have been slaves in Egypt. We will remember that Someone set a crown of thorns upon His head and payed a hefty price so that we no longer have to carry the thorns and thistles in our lives. Yet another wonderful way to worship God, and tell about His ways to our children and loved ones who do not know Him as of yet. Can We Go Back to the Table? A deep longing, a yearning I have never known before, has awakened within me lately: to step down from the platform somewhat and bring worship and service of God back to the table, in its various forms. and invited both people groups to become intimate with one another around these two. I, personally, long to see the descendants of Ishmael, Esau and the other children of Abraham, sit with us at each of these tables. My jaw dropped as I stumbled upon an article in one of the Israeli religious newspapers. Apparently, someone managed to breed a red heifer. Indeed, the preparations for establishing a fourth temple (we forget the one Nehemiah had built in our common count of Jewish Temples) are speeding up, some of which look almost like a hallucination. But they are not. The Temple Institute in Jerusalem and the new Sanhedrin (yes, this council is also already set up) has been working for years on the preparation of the various instruments and tools necessary for the service of the priests. Vineyards have been planted for the purpose of producing the wine and oil necessary for Temple worship. Special wheat is being grown in specialized fields, and so are all the other crops needed in order to produce the perfumes and anointing oil. But until now all was done within the walls of the institute itself. For the first time, during this last Hanukka (last month), a temporary altar was erected outside the walls of Jerusalem, not far from Jaffa Gate. While the audience was watching, the future priests practiced the ceremony of offering sacrifices to God. The man with the mike explains to passerby what the priests are doing, the various regulations, the names of the utensils, the blessings and phrases that are to be cited. Lots of Hebrew talking in this 30 min. video, but it is worth watching. What About the Red Heifer? In August this year, a reddish-colored heifer was born in Israel. Why does it really matter? Because it is crucial to the Temple worship. Its ashes are the only way to complete the ritual of purification. Without it, the priests will not be able to minister, even if the temple is rebuilt. Throughout history there have only been a handful of red heifers(some say 7, some 9). To meet Biblical requirements, the heifer has to be born at a natural birth and be entirely red, with no more than two non-red hairs on its entire body. It is also mandatory that it has never been used for any labor or have been impregnated. Once such a heifer is spotted, they burn it and use its ashes for the rituals. One heifer can suffice for centuries. The rabbis have been trying to produce such a heifer for decades, even going as far as cloning, but it never worked. So this is a BIG deal. “This is a requirement of the law that the Lord has commanded: Tell the Israelites to bring you a red heifer without defect or blemish and that has never been under a yoke… the heifer is to be burned – its hide, flesh, blood and intestines. The priest is to take some cedar wood, hyssop and scarlet wool and throw them onto the burning heifer… A man who is clean shall gather up the ashes of the heifer and put them in a ceremonially clean place outside the camp. They are to be kept by the Israelite community for use in the water of cleansing; it is for purification from sin” (Numbers 19:2-9). “The blood of goats and bulls and the ashes of a heifer sprinkled on those who are ceremonially unclean sanctify them so that they are outwardly clean. How much more, then, will the blood of the Messiah, who through the eternal Spirit offered himself unblemished to God, cleanse our consciences from acts that lead to death, so that we may serve the living God!” (Heb. 9:13-14). Many in our nation seem to realize something is missing. Zionism brought us back to the land of our fathers, but did not provide redemption to the tormented soul or any relief to a guilty conscience. Synagogues provide a sense of community, prayer, ceremonial frame. But not atonement. Will there be another Temple? And if so, where? Interesting questions. But as fascinating as all of these things are, they are not my main point in this post. Watching these developments makes it clear: Israel is hungry for another dimension in the worship of God. How sad! They seek the atonement, redemption and purification of blood. They seek to erect a building to honor God, while completely missing The Point: He desires to dwell within them. Not just dwell or abide, but to tabernacle within them. To erect within each one a structure that is according to the pattern found in heaven [see more about it in I Will Tabernacle Inside You]. Have mercy, Lord! Have mercy! I lift up prayers on behalf of my nation. there is a plea for mercy. In two days I will launch our second entirely English Tabernacle Seminar, designed primarily for tourists. Eight participants from various countries will arrive with the purpose of building a tabernacle full of glory in their hearts. For 8 intensive days they will learn what the priests did by each one of the instruments and furnishings in the Tabernacle in OT days, and how we are to apply it today within our hearts. Four others will join them – alumni of our previous Seminar, who graduated last year and are already teaching it in their home countries in various capacities. The goal – healing, victory, glory – are all ready for each one of us only in the Holy of Holies. For that is where the cloud of glory filled the tent. The Red Heifer has already been slain, from before the foundation of the earth. The altar already exists, and the blood that was poured upon it never dries. God, our people is attempting to draw near to you, not realizing that all they are doing is raising making the wall between us and You higher still. Reveal your Faces to us, Yeshua. Reveal to us the Jewish Face of the Jewish Messiah. “Seriously? Roses? Don’t you think it would be a waste? They will throw them away a minute later.” This was my brimming-with-faith response to Rania, who just shared with me something she believed God had put on her heart. Thank God, my bucket of cold water did not go too far. Rania took this reminder from God seriously, and moved fast. She had a logo made, hats and stickers printed, and 300 gorgeous red roses filling up her small car. On December 13th, nine women – both Jewish and Arab – carried these roses up the stairs to Jaffa gate in Jerusalem. I was not prepared for the strong reactions. At times I thought: “Come on, this is just a rose. Take it and throw it away, if you don’t want it. Why make such an issue out of it?” The passers by reacted to it so strongly. It was as if each rose opened a door into their hearts, and pulled out something that usually would take a good 30 minutes of talking to get to. Those roses were prayed over, and they carried with them a message from God. That Thursday ended a bloody week altogether, with some severe terror attacks across the land. So our message – “We are in this together, there is another way!” – had an even deeper significance. Later we moved to the Salah e-Din neighborhood in the city, which is populated mostly by Arabs. 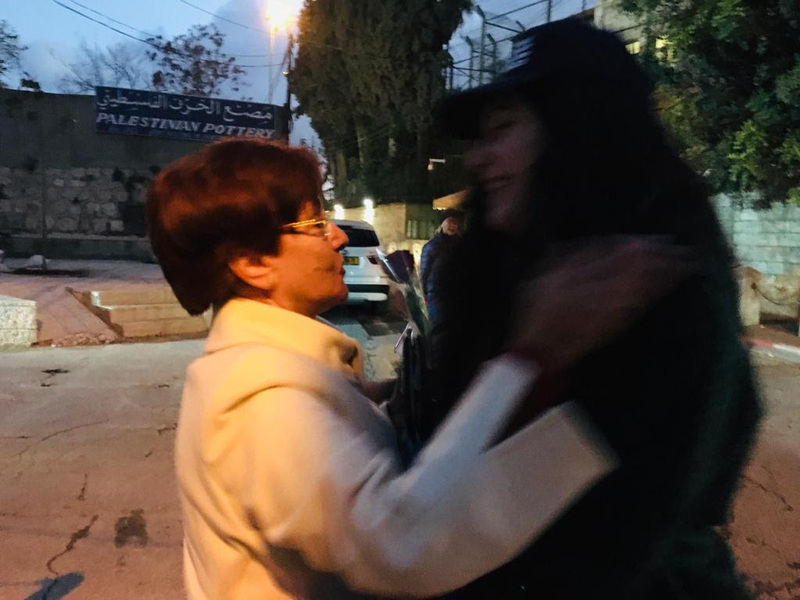 We walked around in pairs – one Jewish woman and one Arab woman, and felt safe, excited, on a mission. Most roses were received with joy! On Salah e-Din street we even caused a traffic jam as cars pulled aside to take a rose. We handed out 300 roses, and I can share with you at least 250 stories that will make you smile or fill your heart with prayer. Don’t worry, I am not gonna do that. But here are a few of the best. “One man said he didn’t want a rose, but he did want to donate towards our revolution! He kept asking where and how he can give. We explained simply that it’s like the love of God, it comes as a free gift and that he just has to receive it. A Muslim lady from the old city was so touched by the rose. “I prayed for her for wisdom and ended with ‘in Yeshua’s name.’ She was so touched, and said that our hearts are in the right place. 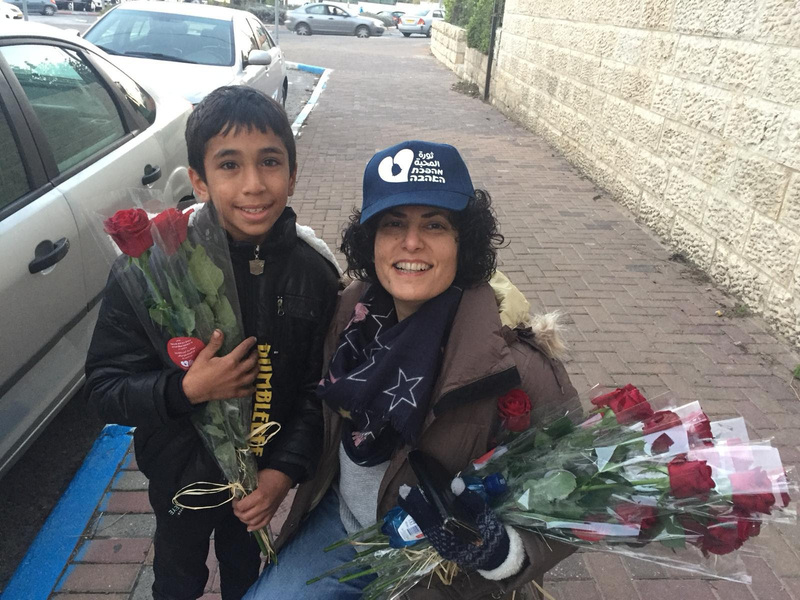 He then asked for another one, “for my mom.” Rania explained to him why she was handing out roses and that the love of Jesus is the reason behind it. This piqued his interest, so Mohammed wanted to know more about this Jesus and where He lives. “In heaven,” Rania explained, “and He loves you so much.” Mohammed was intrigued because he thought no one lives in heaven. “Is he alive?” he asked. Mohammed began to walk and tap his feet on the ground, and then looked at Rania with eyes full of shock. No more pain! You can imagine his excitement! In November 2003 the world watched with amazement: thousands of soldiers were ordered to aim their guns towards protests, who were marching through the streets of Tbilisi, the capital of Georgia. They were protesting against a corrupt regime and the invalidation of their human rights. Everyone expected things to escalate, but no shot was made and the police exercised no force. How come? The protesters were armed with… yes, roses. The guns lost their power in sight of these roses. And most important: the corrupt regime was replaced. Turns out roses can have real power to change things from the core. 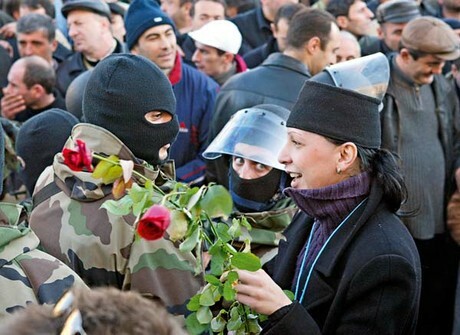 Georgian women facing heavy armed soldiers with roses. It was a sunny morning in 1954. Theresa, an elderly nun that served as a nurse at the French Hospital in Jerusalem, decided to open her room window to let the sun in. That window was almost always shut, as directly underneath it, stretching across to the walls of the Old City, lay what was known back then as “No Man’s Land” – a neglected, thorny and wire-fenced area. How Was It Created in The Heart Of Jerusalem? During the 1948 War of Independence, Israel and Jordan signed a cease-fire agreement for the area of Jerusalem. Moshe Dayan, the commander of the Israeli forces, and Abdullah A-Tal, his Jordanian counterpart, met in a deserted house in Jerusalem. They took a dusty old map, and hastily marked out their respective positions: Israel’s in green and those of Jordan in red. Thus, two border lines were created, facing each other. They were certain the fighting will soon resume and that this was nothing but a temporary and short-term solution. Neither imagined that this map will mark the borders between Israel and Jordan for the next 19 years. But this border, which was later named “the Municipal Line”, cut Jerusalem in two: the Old City and its surrounding in the Jordanian hands, while West Jerusalem in Israel’s. When they all sought to mark the boundaries with wired fences, it turned out that the thick line marked on the map, covered in reality many homes and even entire streets. But the generals have decided, and their decision could not be changed. Both sides debated: who will own these houses, streets and empty spaces (some of which reached more than 100 meters in width)? The St. Louis French hospital in Jerusalem was located on the Israeli side, but its eastern walls, the ones closer to the Old City, bordered the No-Man’s Land. That sunny morning in 1954, Theresa opened the window, breathed in the crisp air, and suddenly felt a tickle in her throat. She leaned forward and coughed a bit. Before she could realize what was happening, she discovered her dentures fell out of her mouth straight into… yes, No-Man’s Land. All shaken and stirred, she ran out of her room, and shared the events of the day with the head of the nearby Notre-Dame monastery. “You have to help me!” she begged. The man’s heart broke at the sight of the elderly lady weeping and sobbing. And yet… No-Man’s Land is no man’s land. “It’s not exactly possible, Theresa”, he tried to gently explain, “you know how hot this border is. The Jordanian snipers are repeatedly shooting Israeli passersby. Every few days, complaints are received in the UN offices of breaches of the cease fire agreement. The No-Man’s Land is a forbidden territory, and as much as I hate it, I fear you will never see your teeth again”. “But it just can’t be!” she exclaimed, “the teeth are right under my window!” She cried and cried, until he decided to try and convince the proper authorities to act to retrieve her dentures. 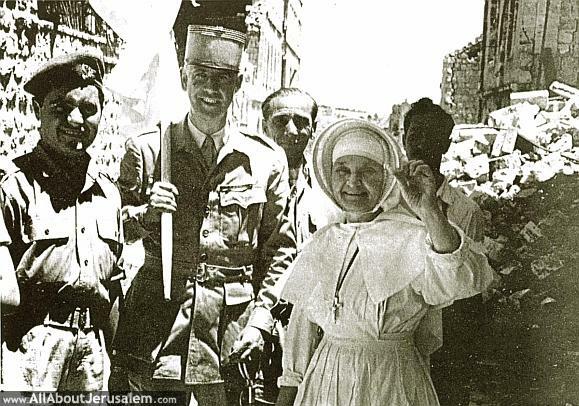 That day he addressed one of the Israeli commanders, Uzi Narkis, seeking help for the poor nun. Uzi’s heart went out for the old woman, and he immediately contacted the UN cease fire committee and explained the situation and the complexity of it. “It is inconceivable”, he exclaimed, “that due to borders issues between us and the Jordanians, that poor woman should suffer so”. The committee members were convinced and contacted the Jordanians that very same day. The Jordanians agreed, on one condition: the search team will number only 3 people – a Jordanian representative, an Israeli and the head of the UN committee. As the sun shone the following day, all the patients at St. Louis French Hospital held their breath as several nuns and three officers cut the wire fences and marched under Theresa’s window. For a long hour they looked through the bushes, calculating the trajectory of the teeth as they fell out the window. The thorns and briers scratched them, their pants were torn from the wired fences, the sun shone mercilessly above their heads, but they were determined to justify the international endeavor. And then… one of them located Theresa’s teeth behind a small rock, whole and intact. He lifted them up high with excitement. Cheers were heard from all of Notre Dame monastery and the St. Louis hospital. The event was so exciting and unique, that Life magazine sent a photographer to capture it. You can see the joyous nun holding her dentures in her hand, while standing next to her is the head of the UN committee, holding a white flag. The image spread worldwide, until some observant reader noticed that Theresa was holding her dentures in her hand, while a full set of teeth is clearly evidenced in her mouth. Ahah! There were other events during those difficult years of division that had happy endings. One of them is about kids playing soccer in the schoolyard at the Frères school, located close to the Municipal Line, on the Jordanian side. They often kicked their soccer balls into the No-Man’s Land. In December of 1965 Israel was asked to return some of these balls to the school as a Christmas gift. Israel immediately agreed. UN officials looked on, as an Israeli officer marched through the minefields of the No-Man’s Land, while Jordanian soldiers called “go left” or “go right” to keep him from stepping on a mine. Two days after Christmas, 28 balls were handed over to the school at a jubilant celebration. Last night was the first night of Hannukkah. One of the main motifs we love to point out during this feast is that of the darkness that is cast out before Light. A famous Hannukkah kids’ song states: we are here to chase out darkness, holding light and fire in our hands, though we are each but a small light, still together mighty we stand. The stories shared in this post are a true testimony to just how a small, tiny light, can indeed become a mighty one. So in light of everything I shared in our Journey to Jordan series, and in light of these heartwarming stories, let us pray that the status quo, life in reality, will not be determined by military commanders, but by little lights coming to chase away any darkness. A little bit of humanity can bring together sworn enemies and blur lines marked hastily upon battle worn maps. We can each shine such lights by proclaiming over this region the name of the Light of the world, who came to shine His light within the darkness. 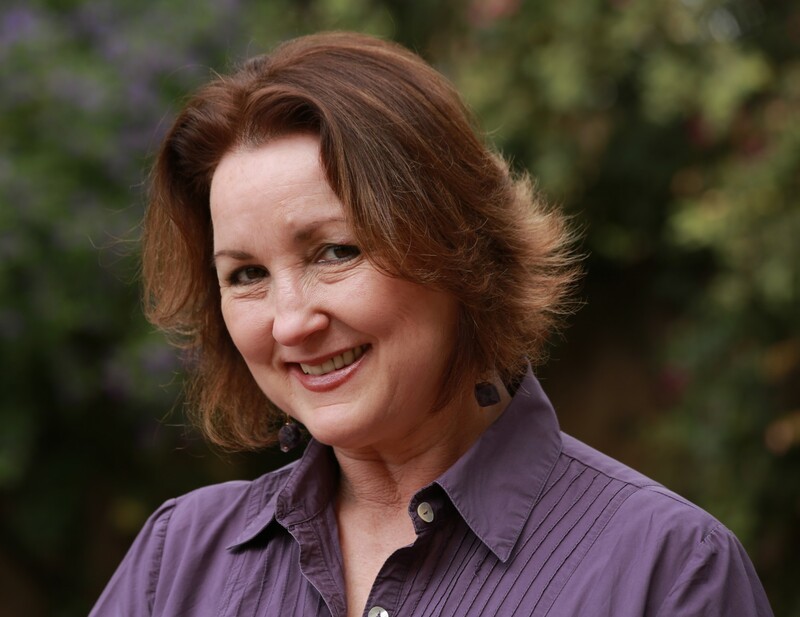 A new year is about to begin, and as it approaches I ask God: Where do you want me to take these new insights you have given me, the new contacts and relationships woven around and within me, the motherhood that is taking the place of the widowhood? Where do you want me to bring Yeshua’s name and light to? Will you stand in prayer with me? Abner was the commander in chief of Saul’s army, which made him David’s sworn enemy. But following an argument with Saul’s heir, Abner defected and joined David’s court. That did not make Joab, David’s seasoned general, a happy man. He did not trust Abner, so he killed him in order to protect David from possible threat. We would expect David to rejoice, but no… he mourned for Abner. He loudly wailed, fasted a full day and ensured the entire nation knew this was his reaction. King David wanted everyone to know that he was not behind Abner’s assassination, and that he wished God will repay Joab according to his actions (2 Sam. 3:33-39). Strange! Why was it so important to David that the nation knows Abner’s blood was not on his hands? Abner, of all people? After all, just a few chapters earlier David had no problem killing a messenger who reported Saul’s death to him, right there on the spot (see 1:14-16). So why was it so different when it came to Abner’s death? David was just about to be crowned as king over the entire nation (up until that point he was king only over a part of it), and perhaps he did not want his kingdom to be established on the blood of Abner. But weather his reason was political or humane, he sets an example of a king who repents publicly, to make an important point and establish peace. The Place: Island of Peace (south of the Sea of Galilee). An artificial small island that was created in 1927, in order to build a power station along the Jordan river. Today it is run by both Israelis and Jordanians. The island is surrounded by two streams that flow from Jordan and Israel, and integrate into the southern part of the river. Such a symbolic picture of co-operation: geographically, politically, prophetically. The Date: March 13, 1997. A Jordanian soldier picks up his weapon, and guns down a group of religious girls who were touring the island. Seven were killed, others wounded. Their blood flowed into the rift, adding to the hemorrhaging, ancient wound, risking the peace agreement between Jordan and Israel that was still in its diapers. Hussein, king of Jordan at that time, was overseas. He hurried back home, crossed the border and visited each and every one of the mourning families. At each house he went down on his knees, asking forgiveness and offering compensation. Why? I wondered. He could have sent a royal epistle, laced in gold. Or a high level representative to bring his condolences. Or simply pick up the phone and talk to the mourning parents. Each of these steps would have been highly appreciated by the Israelis. But he did the most humbling thing he could do – he went down on his knees and owned what happened. Through this act of repentance, king Hussein secured the status quo and planted in the Israeli public opinion a genuine image of a heart that was truly pained and was seeking peace. He also opened doors for the Arab world: the door of repentance, the door of yielding, the door of peace, of sincerity and of crossing over. Today, both Jordan and Israel can choose to keep those doors open, and align with all they represent, or crush it. Listen to how David’s story with Abner ended: “All the people took note and were pleased; indeed, everything the king did pleased them. So on that day… all Israel knew that the king had no part in the murder” (Vs. 36-37). The same can be easily said about king Hussein’s actions. All Israel took note of what he did, and we were pleased. We realized that the murder was the idea of just one man, and that the king had no part in it. What Does That Have To Do With Our Journey? Three weeks after our visit to Beit Lehem (see post #10), we finally made it to the Island of Peace. Well, some of us at least. King Abdullah: Why do you, Israelis, need to declare your independence now? What is the rush? Golda: You cannot call two thousand years “rushing”. Abdullah: We do not want the war, but we will have to fight. Golda: We will fight too. Abdullah: This is your duty. Golda: Right. In that case, we will meet here again after the war. As the three of us walked through the island, we were touched by the level of co-operation between Israelis and Jordanians. The Israeli manager told us about the endless cups of coffee they drink together, and how they even charge the phone for the Jordanian guard, when his battery runs low. We prayed over the water, and especially where the stream that comes from Jordan mingles with the one coming from Israel. We poured salt, balm and oil into it, and blessed this artery of life that flows through the rift. For long months this post awaited its turn at the end of my series on the Jordan journey. I did not know that the very week I will be writing it, the island will become a hot spot politically. As part of the peace accord between Israel and Jordan, it was agreed that the Island (as well as an Israeli village located south of the Dead Sea) will be under Jordan’s sovereignty, yet leased back to the Israeli farmers in the nearby kibutz, so they could continue to cultivate the land (which was actually purchased by them decades ago). Sounds confusing, I know. Sorry about that. Welcome to the Middle East. Last month, king Abdullah II, son of king Hussein, announced that Jordan will not renew the lease for these two locations. Which means that by October 2019, these two enclaves will pass back into Jordanian hands. This is not good news, for both sides. Since that announcement, a few tragedies took place around the rift area, most of them caused by flooding rains and car accidents, taking the lives of entire families and many young kids. Not only that. Since July this year, just a few weeks after we returned from the island, the rift began to shake. Dozens of earthquakes have occurred around the Sea of Galilee and along the Jordan Valley, sometimes even twice a day! Here is a link to the website of Israel’s geophysical institute. It records only the last 30 earthquakes to occur in the Jordan Valley, but there have been nearly 100 in the past few months. One thing is clear, the valley is quaking and claiming lives. This post closes the series of our journey to Jordan, but is far from being the last word that I will write on the subject. So far you have heard mostly my voice, my point of view. But it is only one out of the 6 on our team, thus quite limited. There is so much more. I hope that one day, all six of us will be able to put together our voices, and create a written choir that will bring more depth and riches. As for me, I have been recruited. My present study in the Word focuses on the region and the valley, as I am learning its destiny and how to pray for it. The picture I saw on May – of the bleeding rift – is constantly in front of my eyes, right by my desk. The seeds that were sown during our journey, as we sprinkled our prayers with salt and balm, are there somewhere, carrying the faith and promises we proclaimed. All of us on the team are aware that God had recruited us to something bigger than that journey. God is using these events to turn our eyes and attention to that region, and it will take prayer to align it with His plan. That the Arab Ruth will rise up, realize her destiny and beautiful calling, that must start with yielding and crossing over. God is waiting for both Ruth and Naomi to return to Him. Both sides have torn His heart by rejecting Him and rejecting each other. Pray that the glue-ing and cleaving (that I spoke of in my previous post) will take place. That the Island of Peace will rise up to its name, and continue to be a spot of mutual co-operation, deep understanding, a flow of water and not a symbol of war, pride etc. That the doors opened to the Arab world through the events that already happened in that island, will remain open; that many will choose to walk through, stand in the rift itself and partake in the healing, not in the wounding and blood shedding. Lord, heal our lands and restore your people. Pour your spirit upon us from on high, until the wilderness will become a fertile field, and the fertile field will seem like a forest. Until your justice will dwell in the desert and your righteousness will live in the fertile field. The fruit of that righteousness will be peace; its effect will be quietness and confidence forever. And until your people will live in peaceful dwelling places, in secure homes, in undisturbed places of rest (Isa. 32:15-18). Before leaving Israel, we collected 12 stones, hoping to find a resting place for them in Jordan. Well, we were still carrying them on our way back. I wanted to put them in the water, in the wound itself. To use them to build a little altar, pour some of the salt and the Balm of Gilead we were carrying with us from day one, and declare some more healing. So driving up and down the valley, down and up through the wound, we tried to find the right spot. In vain. Apparently, most of it is guarded by soldiers, either Jordanians or Israelis. After all, this river is the longest border between the two countries. It was disappointing to come back home with the stones in tow, but it also made it clear that our journey is not over yet. Tian Jie coined for us the term “Ripple Effect”. She felt that this journey is the first fruit, and that it will multiply; that what we birthed through prayer had stirred the waters, so wave after wave of this truth will go forward! “Israel, you are a mother nation,” she declared. “The nations are waiting for you to show the kind of compassion that comes from the Father’s heart! Please, come on! We pray that the heart of compassion will increase until Israel, the mother nation, will come into full maturity! At this 70th anniversary, at this turning point, you need to change your perspective when you look at the nations. Look at them through the Father’s perspective. You have enlarged the capacity of your heart to embrace them all! Not only Ishmael will come to your breast, but all the nations will come home too! Equipped with our Balm of Gilead, bread, wine, salt and our 12 stones, we headed the next morning to Beit Lehem – Naomi’s destiny and resting place. This is where she was restored, where her exile ended, where she met again the redeemer. This Israelite town was very small at the time of the Judges. It had since changed its geopolitical face and today is a sprawling Arab enclave with Christian and Muslim residents. No Jews. We knew from the get go that our journey had to end in Bethlehem, in the “House of Bread”. But we also knew it would be illegal for me to enter it. I find that interesting, since back in the days of Ruth and Naomi, Ruth (the gentile) had no right to live in Beit Lehem, had she not joined the Israelite widow. Today, I – a Jew – am not allowed to enter it. 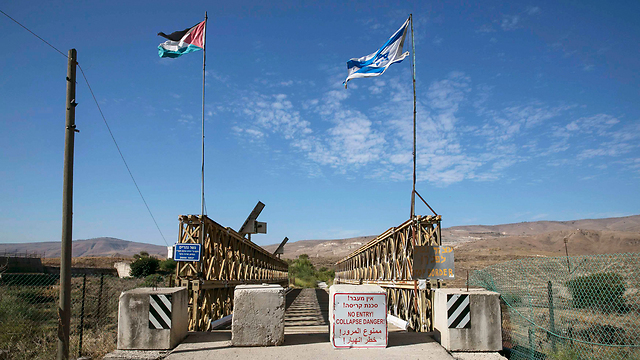 It is illegal for Israelis to cross over the city limits. But because of what I have been carrying in my heart and spirit, and due to an invitation I received a week earlier from a senior elder in Beit Lehem, I knew that I am safe. That the spiritual gates are open for me. That I can walk through the city and declare a change of status for her and for my people. That I will be welcomed there and that some form of relationship need to be established again between the two ancient “widows”. Jesura could not join us in Jordan, but had planned the whole day for us in Beit Lehem. She found a beautiful park at a side entrance to the city, where we could sit and pray. Three Arab leaders from Jerusalem joined us, eager to hear about our whereabouts, as for many years they have been carrying the burden of deep and true reconciliation between the two peoples. We thanked God that both sides are finally able to converse openly about the wound, and prayed that we will be able to touch it with love, with tears and with His blood. I prayed that as we march down the streets of Beit Lehem during the next few hours, we will carry with us the spirit of that young virgin, Mary, who did not ask too many questions, but simply said, “let it be to me according to your word”, and than gave life to The Bread of Life. Something impossible in the natural realm had happened through our journey, as an old wrinkled widow with a dry womb had turned into a mama. We prayed for that womb to be kept open, so that Israel will align with the identity that comes from the womb of Mary. We proclaimed that Beit Lehem will once again become a house of fresh and new bread. That Naomi will cease to be the bitter Mara, and resume her position as a nursing pleasant figure, a caregiver, an instructor of truth (Ruth 4:16). Rania asked God to reveal the Angel of the Lord once more to the locals, exactly where He was born in the flesh. How touched we were when we found out that the streams that embrace this little island eventually pour into the Dead Sea, and mingle with the water coming from the Jordan river. That meant that we were still sowing healing into the rift. We pulled out our 12 stones, and in front of the Moslem guards and gardeners, who were watching us carefully, we started building an altar of peace. When Orpah kisses her mother-in-law for their last goodbye (going back to her comfort zone and out of God’s story), Ruth chooses to cleave unto Naomi. That word – cleaves – means “glued herself.” It’s the same Hebrew word used in Gen. 2:24 to describe the relationship between a man and his wife. Once this “gluing” takes place, the two become one flesh. From that moment on, any separation will involve tearing of the flesh, shedding of blood, and much pain. “Return the glue, Lord,” we begged. “Ruth produced glue when she cleaved to Naomi. The one (Ruth) had the glue and the other (Naomi) the legal inheritance. We therefore spread your glue.” We blessed that glue – that unity of Jew and gentile, especially in this torn city. Finally, we put those stones to rest, with salt and wine and Balm that have been poured on them, mingled with faith that it will birth a binding power, the glue of a Family! We than joined some of Beit Lehem leaders for lunch, visited their church, prayed with them, and did our best to carry with us what God had birthed in us. It is not simple to minister or live in Beit Lehem. We got a closer glimpse of the wound as we listened to the stories and challenges, and were filled with compassion mingled with much hope for a brighter day, when The Star of the Son of Jesse will shine again over that city.